Simply call our local or 800 number to setup a free, in-home closet design or custom storage consultation. Upon arrival we'll discuss your needs, make a sketch of the existing space and determine how to design the most efficient, attractive, organizing system. We'll also discuss material choices, color matches, accessory needs and special requests you may have. In some cases a preliminary quote can be given on the spot. The plan is then transferred into legible drawings for customer review using 3d CAD drawing program. This is then emailed to you for review along with a formal quote. 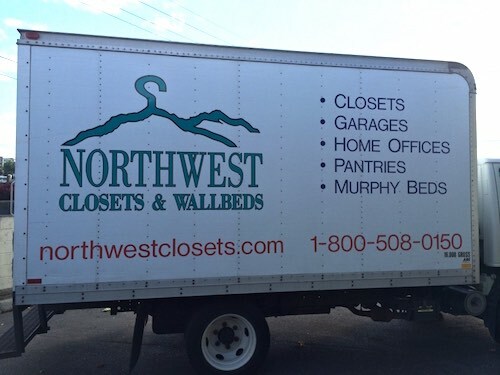 All Northwest Closet projects include materials, labor, and cost of installation in the quote. Any necessary revisions are then accommodated and, if approved, a 50% deposit is made. At that time, the project goes into our production queue. In most cases the installation occurs about 2-6 weeks after date of deposit; this can be modified slightly depending on the complexity of the project. Whether you have ordered Closet Systems or a home storage solutions package, the installation process is kept simple and easy. After you have made deposit, you will recieve a call for scheduling. Once an agreed date is determined, you'll be requested to have all belongings out of the area ahead of time. Except for large, multi-room jobs, the installation time frame is usually a matter of hours. When completed, you will review the job with the installer to make sure that nothing has been overlooked and the area is neat and clean. Balance of payment is due upon completion. Although we are bonded and insured as required by law, you do not have to be concerned with "strangers" in your home. Remember, we're a family owned and operated company. Your installer will either be a family member or trusted associate.